Oscar Fay Adams. Some Famous American Schools. 1903. Nazareth Hall, Andover, Exeter. First opened, 1759; closed, 1779; reopened, October 3, 1785. Under control of the Moravian Church. Principal, vice-principal, nine assistant masters, ninety pupils. College preparatory course of five years. Military discipline. Battalion of three companies. School periodical: The Hall Boy, monthly. Forty acres of grounds, including ball fields, etc. School year begins in September, ends in June. Christmas and Easter vacations. Age of admission from nine to sixteen years. School game: Baseball. School yell: "Hobble, Gobble, Hobble, Gobble, Zis, Boom, Bah." WILLIAM PENN and Zinzendorf: these are verily names to conjure with in Pennsylvania history, and one comes upon them both in the annals of Nazareth Hall. In the midst of a rolling agricultural region midway between the Blue and South Mountains in Northampton County lies what could till recently have been very accurately termed "the retired" village of Nazareth. But from its retirement of one hundred and fifty years it has emerged within the last four, for it is now the goal of two electric-car lines from Easton and one from Bethlehem, and the erection of several cement works has not only added to the number of its industries, but very materially to its dwellings and population. The Moravians of an older generation, surveying the changes from their ancient stone houses, are most probably led to the reflection that, while seclusion may have some pains, publicity, so far as they are concerned, can have few pleasures. There was seclusion enough and to spare, one would have imagined, when in 1682 William Penn granted to his daughter Letitia some five thousand acres in the Forks of the Delaware, on the condition as unexacting as it was romantic, that service should be rendered to him and his heirs forever, if demanded, by paying a red rose in June of each year. This was the only estate in the colony invested with the right of court baron, and it was known, on this account, as the Barony Nazareth. How tenaciously the proprietaries insisted upon their yearly red roses, or how long the fragrant tribute continued to be paid, history does not say, but the Barony Nazareth was bought from William Allen of Philadelphia, in 1740, by the famous Whitefield, who intended to build here a school for negroes and a home for his followers compelled to leave England for conscience' sake. The school building, which he partially completed, still stands in Nazareth, and is known as Whitefield House, but his plans were hindered of their fulfilment, and in 1741 he was obliged to sell the estate, which was then purchased by Bishop Spangenberg of the Moravian body. It seems to have then become the property of the Countess Zinzendorf, and in 1755 a manor-house was begun, and completed the next year as a residence for the Count Zinzendorf when he should next revisit America. His death prevented the carrying out of this arrangement, but the great structure was of much service to the Moravian Brethren, who occupied it in 1757 for the purposes of a Synod, whose members were escorted to and from the meeting by armed men as a protection from the hostile Indians of the neighbourhood. The Moravians were men of peace, but, like other non-militant Christians, were sometimes forced to depend upon the good offices of those of more martial mould. In 1759 a new chapter in the history of the Barony Nazareth and of the Zinzendorf manor-house was begun, for in that year a boarding-school was opened in the building for Moravian youth. A communistic system prevailed among the Unitas Fratrum, to use the official title of the church, and the boys attending the school were educated at the expense of the Moravian body. In 1762 this system came to an end, and as an immediate result the Nazareth school was reduced in numbers and in 1779 was closed. But not for long did the stately structure, which had been built after the plan of a Silesian manorhouse, the better to please the good Count who was destined never to see it, cease to echo the sound of boyish feet. 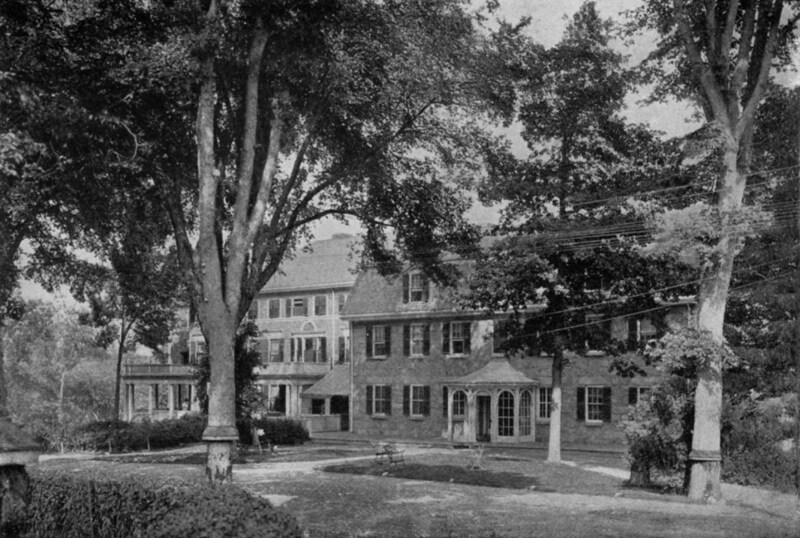 The Moravians had obtained new light in the meantime, and when the Revolution was over it was decided to admit other than sons of Moravians to the school, and accordingly, in 1785, Nazareth Hall began its second career of usefulness, this time as a "Pedagogium, or Boarding-school." In this twentieth century an institution which announced itself as a "Pedagogium" would be doomed to failure from the start, but either people cared less about names and more about things in the closing years of the eighteenth century than do their descendants, or else the name may have struck popular fancy as musical, or peculiarly fitting, or what not, for the fame of the "Pedagogium" soon spread abroad in the land, and from Europe and various parts of the United States, as well as from the isles of the sea, boys came to the Barony Nazareth as the faithful to the birthplace of the Prophet. By 1810 two hundred and ninety boys had been entered on the school rolls, surely a very creditable showing for the time and place. It was not precisely a cloistered existence that was led by the "Brethren," as the instructors in those far-off days were called, but their naïve, childlike simplicity and unfamiliarity with the customs and thought of the world outside of the Barony Nazareth finds its only counterpart in the cloister of some secluded convent. It was the custom at Nazareth to hold monthly meetings of the Brethren teachers, of which written records were kept and which seem to have commonly closed with a series of recommendations as to school management and discipline. These "Minutes of the Monthly Meetings in Nazareth School for Exercises in Reading and Speaking" have all been preserved in manuscript volumes in which the handwriting is as clear and sharp as if penned but yesterday, though the earliest is dated 1785. The minutes for July 3, 1794, for instance, begin with an enumeration of the names of "scholars who learn Latin," followed by those of "scholars who do not learn Latin." And after these comes the significant entry: "the scholar who learns nothing: Nathan Ray Green." Whether it was pure obstinacy on the part of young Nathan that is here taken note of, or simple inability to acquire knowledge, we are not told, nor shall we ever know. For aught we learn to the contrary, Nathan may have been in most things an attractive, engaging child enough, or a sullen youth the key to whose nature was never found by the Brethren. In either case his has been the hard fate of being pilloried for over a century as "the scholar who learns nothing." One might linger long over these unique records of school life overpast. "It is recommended," say the Brethren more than once, that "the scholars shall not approach the cyder mill," perhaps a wise recommendation, and undoubtedly so is a further recommendation found a few pages subsequently, to the effect that "the scholars should not eat unripe apples." The suggestions cover a wide range, and recommendations against cursing are interspersed with others relating to the weekly bath (more frequent ablutions were distinctly discouraged by the Brethren) and moral conduct. Nor were the recommendations suffered to remain as recommendations solely. They were enforced by a system of fines: "A farthing for talking at meals, a ha'penny for falling on the floor, 1d for tearing a leaf out of a book, 2d for telling a lie, 3d for an oath." The way of transgressors was expensive, from the schoolboy point of view, in the Barony Nazareth a century ago. The first principal of Nazareth Hall after its reopening was the Reverend Charles Reichel, who held sway from 1785 to 1803, and he has been succeeded by fifteen others, all Moravian clergymen, the present incumbent, the Reverend Simon J. Blum, having been in charge from 1897. The assistants have usually been, till recent years at any rate, graduates from the Moravian Theological Seminary and candidates for the ministry. A different policy has prevailed of late, for it has been recognized that persons who use the profession of teaching but as a stepping-stone to another profession may not be the best possible instructors of ingenuous youth. In other ways, moreover, the management of the institution has been affected by changing sentiment. 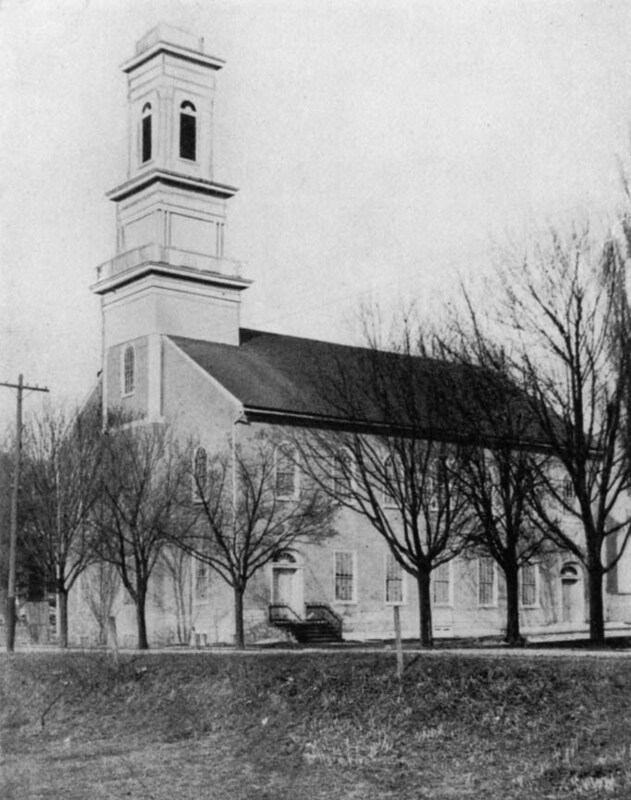 The revenues of the institution, after the necessary expenses were paid, were formerly devoted to the general work of the Moravian Church, a system by which the church at large was benefited at the expense of the school. Had the surplus earnings been devoted to endowment purposes, Nazareth Hall might now rank in equipment and efficiency with the foremost schools of its class. At present they are expended for equipment and kindred uses, but the assistance of loyal alumni is very much needed to place Nazareth Hall where it is, by right of long and honourable service, certainly entitled to be. The business centre of Nazareth is in South Main Street, in the vicinity of the Nazareth Inn. Here are the shops, the banks, and an unusually large number of ice-cream establishments, the goal of Nazareth Hall lads on half-holidays, possibly. A very little to the north of this quarter is the tiny town square, facing which, on the west side, is a very large brick Moravian church with tall steeple and a town clock. Beside it a street leads southward, and a stone's throw in this direction brings one in front of a green surrounded on three sides by a group of pale yellow structures constituting Nazareth Hall. The land rises to the rear, and there are clumps of woodland visible in this direction, and well-tilled farming lands. In front the view to southward takes in a wide extent of rolling countryside, with the Lehigh Hills bounding the horizon, and the smoke from Bethlehem factories, ten miles distant, blurring their outlines. An Old World aspect the famous school presents as one sees it from the roadway. In the centre, and forming the north side of the quadrangle, is the original manor-house, after the Silesian model followed by the early Moravians in America, of limestone covered with rough cast, like the other structures near it. It is of three stories, with a gambrel roof, the latter adorned with a balustrade and a spired cupola. The walls are two feet thick, for it was needful in the middle of the eighteenth century to be prepared to sustain an Indian attack in this quarter of Pennsylvania, but in this matter it is quite probable that its conservative Moravian builders were but copying their Silesian model. Its admirable proportions were seriously marred by the three-storied addition on the east made a generation ago, but in the accompanying view this is fortunately hidden by the clump of firs to the right. "Sister House" of the Moravian Community. There is little here to offend the architectural sense. While none of the buildings can be properly styled beautiful, entire absence of pretence is in itself a virtue, and their dignified, substantial aspect is very grateful to the eye. The ancient Zinzendorf manor-house conveys at once the impression of stability, and this is borne out by the appearance of its neighbours. On the east of the quadrangle is a tall stone structure, considerably over a century old, originally the sister house of the community, when communistic life was practised by the church. Its lower floor is now the dining-hall of the institution, the upper stories serving other uses of the school. The west side of the quadrangle is formed by the principal's residence, also a building of age and substance, with a superb winding staircase in its wide hall worth going a long way to see, and next south of this a building occupied by the boys of the senior class, and next to this, in turn, a disused church whose upper floor is devoted to the uses of a historical society, while its spacious lower story serves as a gymnasium. This structure is not at present owned by the school, but it is hoped that the alumni may one day feel moved to present it to the institution, when its present capabilities will very probably be extended by the addition of a swimming-pool, for which a brawling brook close at hand offers tempting possibilities in the way of water-supply. More completely than any other school hereinafter described Nazareth exemplifies the loco parentis principle in school government, in which matter it is merely following out the intentions of its early founders. It is a principle that has been continuously tested in Moravian institutions in Europe and in America for a century and more, and there are no present evidences of change in this particular. Perhaps the contrast is greater between Nazareth and Exeter, in regard to governing principles, than between any other two institutions we shall consider, and probably each school would look askance at the system pursued at the other. But while each might claim that its method had worked well it might be exceedingly difficult to prove that it would not have prospered even more under the opposite system. OLD MORAVIAN CHURCH AT NAZARETH. Lower story now occupied as a gymnasium for Nazareth Hall. The ninety or a hundred pupils at Nazareth are divided, mainly according to age, into five room companies, each having its apartment for study and dwelling purposes and one or more dormitories. Each company is placed under the charge of one or more masters, alternately on duty for a day at a time, from their downsitting to their uprising in a very literal sense. Not only are the assistant masters with their charges during the hours of study and recitation, but they accompany the boys to church and chapel, as well as to meals, are expected to be with them on the playgrounds, as well as on their excursions and walks, and at night they sleep in the same dormitory with the members of their especial room company. Precisely how pillow fights can be successfully conducted under the wakeful eyes of two masters whose beds are on opposite sides of the large dormitory or sleeping-hall, it is not easy to understand. And yet the temptations to this particular form of athletic exercise must be very great. In the opinion of many parents the strictly parental system pursued at Nazareth minimizes the disadvantages of boarding-school life, and in the case of the younger pupils much may be said in its favour. When the older lads are considered there may be honest differences of opinion on the point. But however desirable the system may be for the boys themselves, it cannot be said that it materially increases the joys of living for the masters. One may admire boyish character never so much and yet not particularly desire its uninterrupted contemplation for all of the hours of the twenty-four. Moreover such constant, unrelieved association with juvenile life has its narrowing effect upon the mind of the master. After a time he loses his sense of perspective, attaches undue importance to trifles, and is disposed to judge of the world at large by the ethical and other standards of the schoolroom. And this narrowness must inevitably react upon his teaching. The head master, whose field is wider, who by the exigencies of his position is compelled to mingle daily with other men, experiences little or nothing of this; it is the master whose duties require his presence with his charges day and night, who undergoes the dwarfing process. In certain details the system at Nazareth makes strong appeal to careful mothers. For instance the clothing of the lads is kept in a large apartment called the Clothes Room, in charge of an attendant who at stated times supplies each lad with what he may require, and attends to the proper care of the clothing in addition. On Sundays the pupils attend worship in the Moravian church of the town, and on week-days there are morning and evening devotions in the school chapel; neither of them irksome exercises as regards length. Nearly the entire lower floor of the manor-house is occupied as a chapel and general assembly room, a spacious, dignified apartment not wholly unchurchly in appearance, and with several marble tablets upon its walls. The schoolrooms are situated on the floor above, and above this, in turn, are the rooms occupied as dormitories for all but the seniors. It may chance that when the visitor takes his first look at Nazareth the echoes of this ordinarily quiet neighbourhood are vociferous with the roll of drums, the scream of the fife, or the shrill call of the bugle, sounds well calculated to upset one's preconceived opinions as to the peace-loving proclivities of the Unitas Fratrum, when supplemented by the sight of uniformed cadets marching and countermarching with murderous-looking muskets across the turf of the quadrangle. Moravians and muskets! What an unexpected combination! One would as soon associate in one's mind Dunkers and dumdum bullets, Mennonites and Maxim guns, Quakers and lyddite shells. The staunchest peace principles nevertheless find it sometimes impossible to withstand a particular strain imposed upon them, and in the early months of the American Civil War, in accordance with the prevailing sentiment, military discipline was established at Nazareth as a means of physical exercise, as in many another school at that period, and has ever since been continued. There are three companies forming the Hall battalion, a remarkably full complement of officers enabling rather more than one-third of the cadets to occupy positions of authority dear to boyish hearts. A fairly strict military discipline is also maintained, guard duty and extra drill being imposed as punishments, with Reveille beginning the day at 6.15 A. M. and Taps ending it at 9.15 at night. That the military part of the school's history is not altogether a matter of uniforms and peaceful marching upon green turf is evidenced by the presence in the midst of the lawn of a monumental shaft to the memory of "the Sons of Nazareth Hall who died that their Country might be Healed and Live" during the Civil War. There are twenty-eight whose names are thus commemorated, and the records of the institution further reveal that, in addition to these twenty-eight, two hundred and six Nazareth Hall graduates entered the army and navy of the United States at this period; twenty-eight served in the Confederate army and navy, five of whom died in that service; three became generals in the Confederate service, and five in that of the Federal army, with one who became a fleet engineer. The sons of a professedly militant institution could scarcely have hearkened more readily to the call of country than these heroes who had been trained under the care of the peaceful Unitas Fratrum. The age of admission to Nazareth is from nine to sixteen, and besides the preparation for ordinary business life the college preparatory course is designed to fit pupils for entrance to college or technical schools, the college haven of the largest number appearing to be Lafayette at Easton, at which, as well as at Lehigh University and the Moravian College at Bethlehem, Nazareth graduates are admitted without examination. In an upper room of the seniors' house is a printing-office managed by the cadets, where the school periodical, a monthly, entitled The Hall Boy, is printed. The presswork is done entirely by the students, and a very creditable piece of work it is. In its one hundred and eighteen years of continuous life, counting from 1785, nearly four thousand boys have been graduated from the school, and not a few of the number have risen to eminence. Among graduates of recent years one comes upon the name of the new cabinet Secretary of Commerce and labour, George B. Cortelyou, the private secretary of Presidents McKinley and Roosevelt, who entered Nazareth Hall at the age of eleven. Of the nine schools of which some description is attempted in this volume, Nazareth is the only one whose rates for board and tuition make it possible for persons of limited income to consider it with relation to the education of their sons. Other schools there are of excellence whose charges are moderate, but they are not very numerous, and among those selected for comment here Nazareth alone offers preparation for college at rates adapted to slender purses, as has just been said. But like many other schools of its class, it stands sorely in need of both scholarships and endowment. 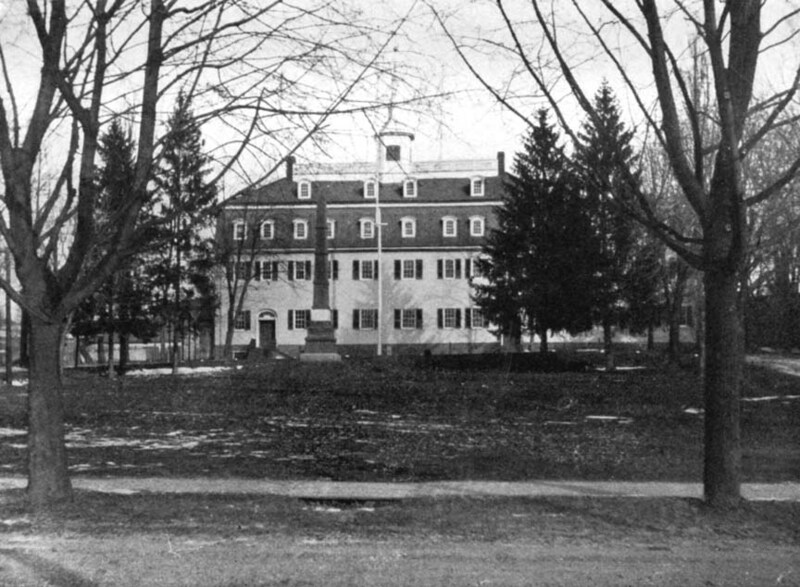 With its forty acres of farm and other land surrounding its buildings, it has ample room to grow, and when, either by the changed policy of the Moravian Church or by the generosity of alumni, its equipment and resources are increased, we may look to see the ancient institution of the Barony Nazareth take its place beside the great American schools of its type, differing from them, as they in turn differ from each other, but in no sense their inferior. Although under the control of the Moravian Church, the school is not sectarian, and under its present head-mastership anything approaching to sectarianism is unlikely to flourish. The chapel exercises are of such a character as to be acceptable to persons of very diverse faiths, and the Sunday attendance at the Moravian church in the town is not devised with any intention of making young Moravians of the cadets. Regarding the advisability of the loco parentis system, which is followed to a very considerable degree at Saint Paul's and Saint Mark's, and to a lesser extent at one or two more of the schools here discussed, but which finds its completest exemplification at Nazareth, opinions will long continue to differ. As a system it has its undoubted advantages from several points of view. Whether these advantages are or not overbalanced by the disadvantages is for parents to determine, and the degree of success attained at Nazareth under its pursuance entitles its management to respectful consideration. And when all is said, and the dust of argument has finally cleared away, it will be found that youth have thriven under the operation of theories the most diverse, and that the real end of education has usually been attained after all, whether the plan has been that of Nazareth or Exeter. Founded, April 25, 1778; opened, April 30, 1778; incorporated, October 4, 1780; school year begins in September, closes in June. Daily morning chapel, Sunday chapel services; fifty scholarships; libraries: Samuel H. Taylor Memorial, with 2,500 books; Associate, with 800 special libraries in English, classics, history, and natural science School organizations: Society of Inquiry (religions); Philomathean and Forum (debating); papers: Phillipian (semi-weekly), Mirror (monthly), Pot-Pourri (annual); Glee Club, Banjo Club, Mandolin Club (musical); Athletic Union, including Baseball, Football, Athletic and Tennis Associations; Camera Club, Dramatic Club, Golf Club. Athletic fields: including three baseball and three football fields, running-track, and athletic house, golf links, gymnasium. No specified age for admission to the academy. IN the class which went forth from Harvard College in 1771, sixty-three in number, was one Samuel Phillips, the son of a former master of the grammar school at Andover. His name will be found seventh on the class roll, but originally it was the eighth, the change being made at the request of the father, who explained, no doubt with the seriousness demanded on such an occasion, that his social position entitled the lad to the better place. His request provoked discussion, however, the outcome of which was the discontinuance at the college of the custom of placing students according to the social standing of their fathers. But Samuel Phillips soon proved that he need be indebted to no one for his position; that he could not only make a place of his own, but could keep it also, which was even more important. Soon we find him a member of the Provincial Congress, then, as a manufacturer of gunpowder, coming into intimate relations with Washington. He sat in the convention which prepared the first State constitution of Massachusetts, was successively judge and State senator, and at the time of his death was lieutenant-governor of his native Commonwealth. A man of his stamp well knew how to value the worth of higher education, and even when under Master Moody's care at Byfield the young Samuel may have had some dim notion of what he would like to accomplish toward extending that education to others in future years. Be that as it may, however, it was not so many years before he was able to carry out a carefully arranged plan for the education of the boys of Andover, for on the twenty-first of April, 1778, Phillips Academy at Andover was founded. The founding was made possible by the gifts of the Honourable Samuel Phillips, and his brother, the Honourable John Phillips, of one hundred and forty-one acres of land in Andover, and some two hundred acres in Jaffrey, New Hampshire, with the large sum, for those days, of £1,614. Very little time was wasted in getting ready after the deed of gift had been drawn up, for on the thirtieth of April the school was opened, under the care of Eliphalet Pearson, a classmate, at Byfield and Harvard, of Samuel Phillips. On the fourth of October, 1780, the institution was incorporated as Phillips Academy, the earliest chartered academy in New England. The deed of gift, a document of somewhat formidable length, and commonly styled "The Constitution of Phillips Academy," sets forth with careful precision the purposes of the givers. According to this instrument it was proposed "to lay the foundation of a public free SCHOOL or ACADEMY for the purpose of instructing Youth, not only in English and Latin Grammar, Writing, Arithmetic, and those Sciences wherein they are commonly taught; but more especially to learn them the GREAT END AND REAL BUSINESS OF LIVING." Farther on the Phillipses assert that "the first and principal business of this Institution is the promotion of true PIETY and VIRTUE; the second, instruction in the English, Latin, and Greek Languages, together with Writing, Arithmetic, Music, and the Art of Speaking; the third, practical Geometry, Logic, and Geography; and the fourth, such other of the liberal Arts and Sciences or Languages, as opportunity and ability may hereafter admit, and as the TRUSTEES shall direct." Very much in earnest were the Phillipses in regard to the institution they had founded, and in the century and a quarter that has elapsed since they penned their deed of gift, the academy has abundantly justified their anticipations and hopes concerning it. Thirteen boys awaited Master Eliphalet Pearson, or, as irreverent youngsters came in time to style him, "Elephant Pearson," on that thirtieth morning of April, 1778, where in these days over four hundred boys assemble. We are assured that the first master of the institution was of commanding presence, a decided advantage in the head of a school in any century, and that he held his pupils well in hand is abundantly certain. Big name, big frame, big voice, and beetling brow." School was school in the days of "Great Eliphalet"; there was no trifling with frivolous matters such as the sciences, history, modern languages and the like. Education was felt to be a most solid, serious matter, and we find the master in 1780 thus assuring the trustees in regard to his method. "School begins at eight o'clock with devotional exercises; a psalm is read and sung. Then a class consisting of four scholars repeats memoriter two pages in Greek Grammar, after which a class of thirty persons repeats a page and a half of Latin Grammar; then follows the 'Accidence tribe,' who repeat two, three, four, five, and ten pages each. To this may be added three who are studying arithmetic; one is in the Rule of Three, another in Fellowship, and the third in Practice. School is closed at night by reading Dr. Doddridge's Family Expositor, accompanied by rehearsals, questions, remarks, and reflections, and by the singing of a hymn and a prayer. On Monday the scholars recite what they can remember of the sermons heard on the Lord's Day previous; on Saturday the bills are presented and punishments administered." No doubt a forceful person like Master Eliphalet, with his commanding presence, found much to do on those doleful Saturdays when "punishments" were "administered," and doubtless, too the "sermons heard on the Lord's Day" were listened to with rapt attention if not pleasure, lest some hapless slip in the Monday rehearsal should entail the Saturday punishment. Bright, dull, pale, blooming, common, picturesque. At Sinai's foot the Giver of the Law." Perhaps the school relaxed a little the sternness of its curriculum in Master Adams's day, but in the earlier years of his rule, at least, such relaxation is not markedly apparent. One of the students in 1814, William Person, assures a friend in a letter that students are liable to be called on Monday "to give an abstract of the sermons." And it will be noted that he says sermons, not sermon, for two and not infrequently three sermons of goodly length formed the Sunday diet of old and young alike when the nineteenth century was still in its teens. Person goes on to inform his friend that for "morning recitations on Monday we are allotted ten pages of Vincent's explanations of the Westminster Assembly's Shorter Catechism. This must be committed on Sunday or Monday morning, as we have no other time. For morning recitations on Saturday about as many pages of an inestimable tract by Mason on Self-knowledge." If young Person's letter was destined to pass beneath the eye of the master we are at no loss to understand the characterization of Mason's immortal work as "inestimable," but no doubt his private opinion of its merits varied somewhat from his written expression of them. "For absence, tardiness, and for every detected foible our names are entered on the monitor's bill, with the charges respectively annexed, which is shown to the Preceptor at the end of the term, and we are obliged to give satisfactory reasons for remissness in these particulars, etc. This relation will at once convince you that I have but little leisure." No, indeed! Leisure was not a thing that Phillips Andover boys were expected to know anything about from any personal acquaintance with it. Masters of the type of Pearson, Adams, and their contemporaries, were earnest, conscientious persons but unable to understand that schoolboys differed from men except in size. Any such harmonious balance of work and relaxation as schools now aim to establish would not have been comprehended by them. And to say this is only to declare that they were not ahead of their age. In the years from 1833 to 1837, in which Mr. Osgood Johnson was at the head of the academy, there was less of sermons and the Assembly's Catechism mingled with the wine of the students' existence than formerly, and more of the classics, while under the long régime of Samuel H. Taylor, from 1837 to 1871, the institution gradually took on much of its present character. The principalship of the late Doctor Cecil Bancroft, only so recently at an end, is too freshly in the minds of Andover men scattered all over the United States to need recalling here. The two Phillips academies of Andover and Exeter differ very materially in their immediate surroundings from the other schools described in these pages. Both institutions are situated in the midst of small towns, while Lawrenceville as completely overshadows its tributary hamlet as some mediaeval cathedral dominates the humble village that clusters around its base; Saint Paul's, though within the compass of a half-hour's walk from a small city, is yet in a distinctly rural neighbourhood; Groton is neighbour only to a few scattered farms; Saint Mark's appears to draw away its exclusive skirts from too close contact with the farming village near at hand, and Shattuck, though within the small city of Faribault, is hardly of it. Of the two schools Phillips Exeter is the more closely hemmed in by neighbouring buildings and estates, and Phillips Andover, though at first sight seeming to form an integral part of the town of Andover, is presently discovered on wider acquaintance to be more or less dissociated from it and to be capable of indefinite extension in at least one direction. Perhaps one obtains the impression of abundance of space more fully at Andover than at any of the other institutions we are considering, for all of its situation in a fair-sized town. The principal buildings at Shattuck stand in neighbourly proximity, and the same may be said of those at Lawrenceville, and Groton, while those at Exeter may be said to stand almost cheek-by-jowl. Belmont and Saint Paul's resemble it the most nearly in this respect. Although the buildings of the last-named institution are scattered over a wide territory, yet they may be said to be arranged in clusters or groups, the members of which are by no means widely severed. But Andover, on the contrary, is a school of magnificent distances, or so the visitor may fancy who first beholds it on a winter's day when a keen blast is sweeping over the hill on which the academy and its equally famous neighbour, the Theological Seminary, are situated. At such times the gymnasium, the dining hail, the new archaeological building, and the recitation hail, will be apt to seem to him as widely sundered as the ends of the earth, and the athletic house, by the running track, to belong to another planet. But Andover youth most probably make light of these intervening spaces and skip over the icy hilltop fields with all the agility of the wild goat upon the mountains. Andover, in the opinion of many, at least, represents, more nearly than any other of the schools here considered, the typical American school spirit, with Exeter a close second in this respect. The two institutions, it must be acknowledged, are sharply differentiated from the others. Lawrenceville and Saint Paul's certainly do not foster anything like the democratic spirit dominant at Andover, and to a slightly lesser extent, at Exeter, while Groton, at least, makes no attempt in that direction. Saint Paul's, Saint Mark's, Groton, and Shattuck, are "church" schools, and to that extent removed from the typical American type, which is not adequately represented by any institution definitely under the control of any one religious body. Belmont, like Lawrenceville, cannot be pronounced a typical school, and Nazareth, as a Moravian institution, stands in the same category as the "church" schools. All this is not to say that the democratic American ideal is not sought for in the most of these, but that from the nature of the case it does not have as free play elsewhere as at Andover and Exeter. Boys are democratic by nature, and although shades of the social prison-house begin very soon, in some instances, to close upon the growing boy, he fortunately retains until his first year in the university a good deal of the spirit of indifference to lines of social cleavage. This healthy indifference seems, if one may judge from present indications, more easily preserved at Andover than elsewhere among the great preparatory schools. At all of them in theory precedence is awarded, among the lads themselves, to character, excellence in athletics, and, to some extent, in scholarship, but in practice oftentimes the workings of an opposite theory may be detected by close observers. This opposite theory may be acted on to some degree at Andover, but the field for its action is there more limited. 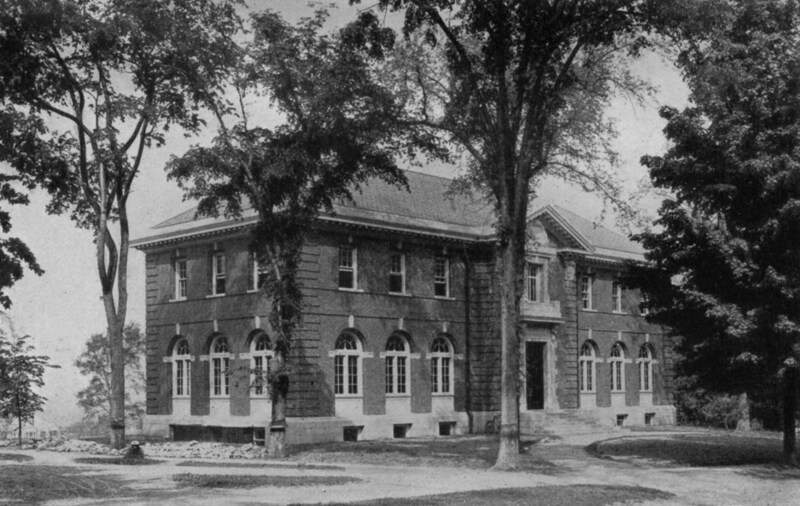 The very newest of Andover's structures is the spacious Archaeological Building, formally opened in March, 1903, a gift to the academy from an alumnus, representing an expenditure of fifty thousand dollars, and its collections, a gift also, are valued at nearly as much more. No other great preparatory school in America possesses such an educational adjunct, and the course in American archaeology which the building and its collections make possible aids materially in securing the all-round nature of instruction which Andover prides itself upon offering. Its director, Mr. Warren Moorehead, has long been known as an authority in this department. 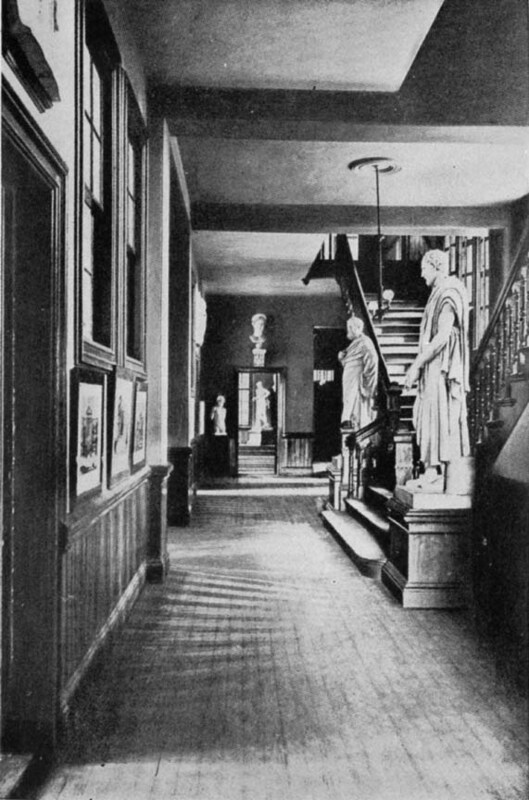 The collections are exhibited on the main floor; on the upper floor are a lecture-room, and a spacious and attractive school reading-room; while in the basement are rooms for the use of the managers of the different athletic organizations, for the use of the Camera Club, and for that of the editors of the various school papers, so that from its very nature the structure must necessarily fulfil the hope of its giver that it will become a centre of school life. It should be added that both interior and exterior of this building are well worthy of notice architecturally. Almost as new as the Archaeological Building, and even more impressive from an architectural standpoint, is the great Borden Gymnasium, another gift to the Academy, and perhaps more generally appreciated than the one just described. It presents a most dignified exterior, and all the comforts, and even the majority of the luxuries demanded by the modern athlete are contained within it, with one important exception, a swimming-pool. As that adjunct, however, is contemplated in a structure at a lower level to be erected ere long in connection with the gymnasium, its absence need not therefore be remarked From the rear windows of the gymnasium one obtains a good view of the Brothers' Field, likewise a gift to the academy, constituting the athletic ground of the institution. It comprises two football and two baseball fields in the most excellent condition, thanks to the labours of the Athletic Association. The grounds around the gymnasium have been laid out under the direction of the most competent American landscape architects, and their beneficent operations will in time be extended over other portions of the academy property. In certain respects the dining-hall will prove to many persons, as it did to the writer, the most interesting of the many buildings connected with the institution. 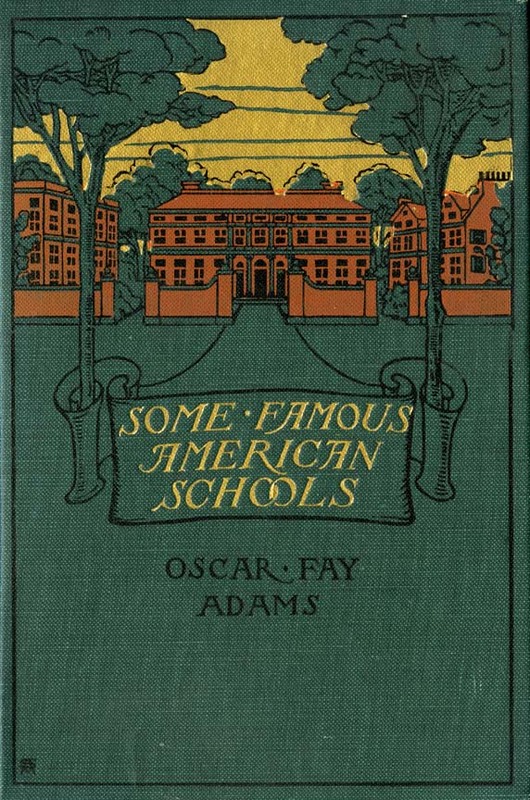 It is the old brick academy, to which Doctor Holmes refers in his poem, "The Schoolboy," already quoted from, and for whose excellent proportions the famous American architect Bulfinch was originally responsible. It was for a long period occupied as a gymnasium, but having been partially destroyed by fire was very lately remodelled, and rebuilt, and an extension added in the rear. The lower floor is now occupied as a dining-hall, and the upper one can very readily be put to the same use. Two rows of white columns extend lengthwise through the spacious, high-ceilinged apartment, which, with its small tables and chairs of black oak, forms, with the white walls and many columns, one of the most cheerful, attractive dining-halls it is possible to conceive of. The hall is managed by a committee made up of the academy treasurer, a member of the faculty, and three of the students, the general oversight being left almost entirely to the students on the committee. As a factor in the promotion of proper school spirit the dining-hall has proved of great value and the arrangement of small tables, each seating four persons, does much to foster social feeling. One cannot imagine anything like the same social spirit being aroused at the long tables in the dining-hall at the Groton Hundred House. Had either Andover or Exeter desired to carry out the loco parentis principle preferred at Saint Paul's, one important obstacle would have blocked the way, as it has to a very considerable extent interfered with school discipline in the past ---the system of placing boys in private houses for their board and lodging. This custom originated in the days of simpler living, when academies were unprovided with facilities for boarding and lodging more than a very few pupils, and the majority were therefore boarded in private families. In theory the boy was merely transferred from the home of his parents to another home in the academy town, and in very many cases he did so find another home. 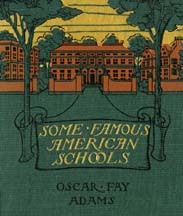 But as academies increased in size the commercial aspect of providing food and accommodations for the students came more and more into prominence, and the more unscrupulous of lodging-house keepers, desirous of retaining their lodgers, sometimes connived with the students under their charge in attempts to set school discipline and regulations at nought. Both at Andover and Exeter the evils of the lodging-house system have proved so burdensome that in recent years dormitories have been erected at each institution, and at Andover fully one-half of the pupils are thus housed, and as time goes on a still greater proportion will be so lodged, as additional structures for this purpose are already contemplated by the academy. Of course such a radical departure from the old system met with much opposition from persons in the towns whose living depended upon sums received from their lodgers, and this was especially the case in Andover, but as the academy was not supposed to exist merely as a source of revenue to Andover townspeople, the school authorities have resolutely persevered in their efforts to establish the dormitory system. The dormitory plan is, therefore, a new feature at Andover, and the buildings in which it is carried out are very new and, if not beautiful, at least substantial. The largest of them is the Bancroft, a severely plain modern rendering of the simple type exhibited at Harvard University in ancient Holworthy Hall, so far as its exterior is concerned, albeit with three entrances instead of two. As a protest against the ornate style for which the sixties and seventies were responsible, and which is shown forth in the two recitation-halls at Andover and Exeter, the severity has its value, but architectural asceticism of the Trappist variety might have been avoided. 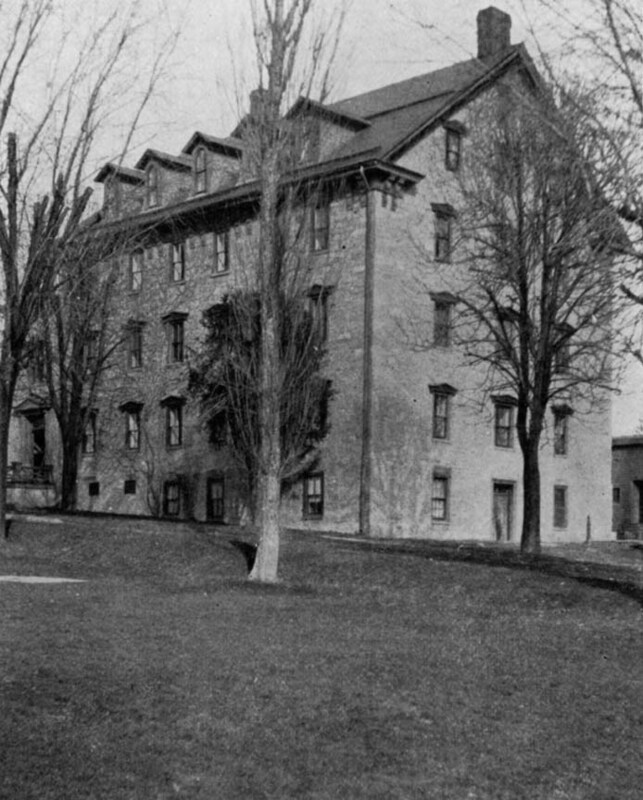 However, once the Bancroft is entered, the students' apartments are found to be as attractive as one could desire, and there appears to be no evidence that the objections prevalent at Shattuck to "draperies and other hangings" as "littering up" the rooms, are shared by the Andover authorities. The writer cannot help the feeling that much is gained in arousing a spirit of decorum, at least, if not of reverence, by devoting a school chapel strictly to devotional purposes. Lawrenceville, Saint Mark's, Saint Paul's, Shattuck, and Groton certainly secure, in the existence of their separate chapels sacred to religious uses, something of importance that is lacking where the chapel has no architectural significance and is merely an apartment employed for secular purposes as well. Belmont, we believe, contemplates the erection of a school chapel in the future, and it is greatly to be hoped that Exeter will do the same. At Andover until the present year (1903) the morning chapel exercises have been held in the large assembly-hall of the main academy building, but pending repairs to this structure they have been held in the large stone chapel belonging to the Theological Seminary. LATIN COMMONS, PHILLIPS, ANDOVER, BUILT 1836. PRINCIPAL'S AND TREASURER'S OFFICE, PHILLIPS, ANDOVER. The loyalty of Andover men to their academy has been shown in many ways in recent years. 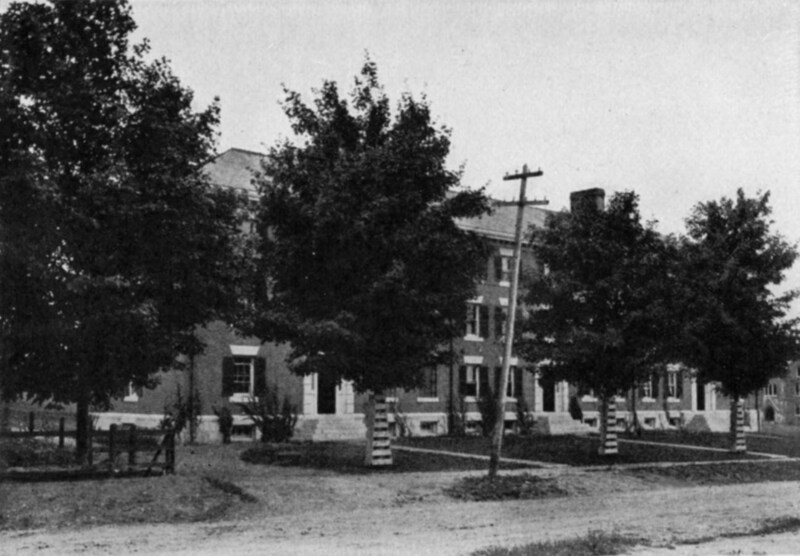 In addition to the gymnasium and the Archaeological Building, already named as gifts to the institution from alumni, the Bancroft, Taylor, and Eaton Cottages, erected for dormitory purposes, are gifts from a similar source, nor do these complete the tale of the generosity of Andover graduates, while the class of 1892 are already moving in the matter of securing a much needed infirmary for the school use. The prevailing building material is red brick, and generally of a hue that deepens and grows richer with time. 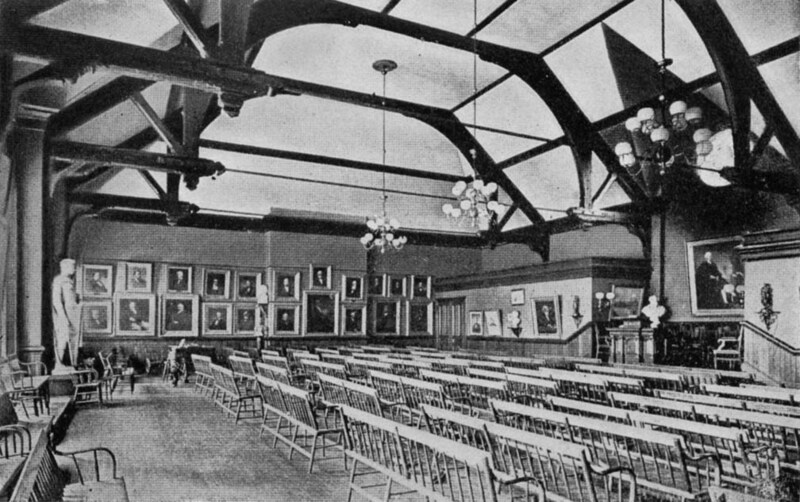 The administration office, the great science building, built in 1891, the recitation-hall, now (May, 1903) undergoing extensive reconstruction, as well as other structures are all of this material, and the effect of such masses of warm colour either in the midst of expanses of snow and seen through bare, ruined choirs where late the sweet birds sang, or rising from out green turf and with outlines half obscured by foliage, is equally grateful to the eye. The colour varies in depth somewhat, but no such discordant note has been struck in this respect as may be noted at Harvard in the presence of the pale sandstone of the Fogg Museum in the midst of the red brick structures of the college yard. Even to the casual visitor and observer, Andover would appear to be upon the threshold of, if not precisely a great change, at least of a great extension of influence. The adoption of the dormitory system, the opening of the new dining-hall, both mean the rapid spread of social student life, the development of a more decided attachment to the school on the part of its pupils. The immense gymnasium makes possible a degree of physical culture not before attainable, and to this end the new athletic fields and the extensive golf links contribute. The scientific department adds to its capabilities with each year; the new archeological department renders Andover unique in this respect at present; while no undue spirit of conservatism prevails regarding the adoption of new methods and customs in the system of general management, if they appear likely to work for the good of the institution. The plant of the school, to adopt the unpleasing but comprehensive phrase of the moment, is already so extensive as to experience the absolute necessity of spreading still further. The impetus of rapid growth has been acquired, and with such growth will come the greater efficiency induced by quickened enthusiasm and fuller opportunities. And both Andover and Exeter desire to grow, and in this they differ once more from several of the schools here discussed. Saint Mark's and Groton are quite satisfied with their present numbers, one hundred and twenty-five in the one case, and one hundred and fifty in the other. Nazareth is probably not seeking any great augmentation of its numbers, and Belmont and Shattuck are looking, we may suppose, for only a moderate increase. Lawrenceville and Saint Paul's, though they may go on increasing their efficiency by the erection of new buildings from time to time, have nearly reached the limit they have set for themselves; at least this is true in the case of the former school, and if Saint Paul's is to increase very much in size its theory of government must necessarily undergo serions modifications. But, as was just said, Andover and Exeter desire to increase, and there is no good reason why they should not do so. And of the two schools, Andover, from its capabilities as to space, is possibly more likely than its sister academy to expand and develop new spheres of influence. There is no need here to dilate upon the attractiveness of the old Massachusetts town, venerable with its two hundred and fifty years of continued existence. But in the future even more than in the past, the academy is destined to become its distinctive, secular feature, and should the seminary which has made the name of Andover theology so famous ever be removed, as has more than once been suggested, the Phillips Academy will then stand for Andover in the minds of most persons who may recall but vaguely the fact that Andover had once a literary atmosphere all its own, when the affairs of the academy boys were not uppermost in the public mind if Andover was mentioned, nor their doings heralded in the sporting columns of the newspapers. Andover has changed marvellously in many things from the time when the pupils of the "great Eliphalet" closed the "duties of each day" (they seldom spoke then of the pleasures of the day, but only of its duties) by reading at night from the good Doctor Doddridge's "Family Expositor," and Sunday sermons are not now harkened to to the end that they shall furnish a theme for Monday catechizing. They have changed all that at Andover, as Andover theology has suffered an equally remarkable transformation, but what has not been altered at the school is the steady purpose to excel, to get the best that life offers, that the founder hoped to inspire in the youth of his day, as apparent, now, in the study-hall, if signs do not deceive, as on the athletic field. If indeed Andover boys have not yet fully learned the "Great End and Real Business of Living" when they go forth from out these red brick walls on Andover Hill, they have nevertheless made real and definite approaches toward that desired end, and the way thereafter has at least been made plain to their youthful feet. Incorporated, April 3, 1781; endowed by Dr. John Phillips, Jan. 9, 1782; opened, May 7, 1783. School year: thirty-five weeks, including fall, winter, and spring terms of eleven weeks each. Thirty-seven endowed scholarships. 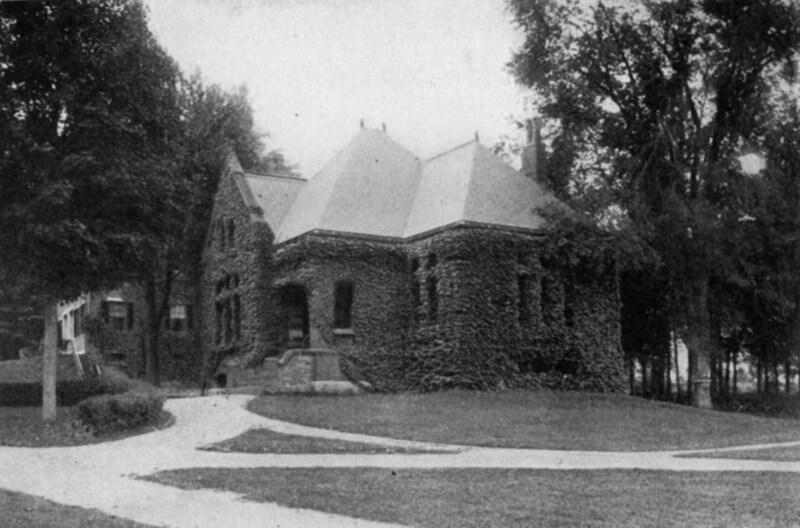 Literary societies: Golden Branch, founded in 1818, and the G. L. Soule, founded in 1881. Religious society: the Christian Fraternity. Campus contains seven acres, with baseball and football grounds, running-track, and tennis courts. Alumni associations: Association of the Alumni of the Phillips Exeter Academy, founded New York, 1883; Association of the New England Alumni of the Phillips Exeter Academy, founded Boston, 1886; Association of the Western Alumni of the Phillips Exeter Academy, founded Chicago, 1893. 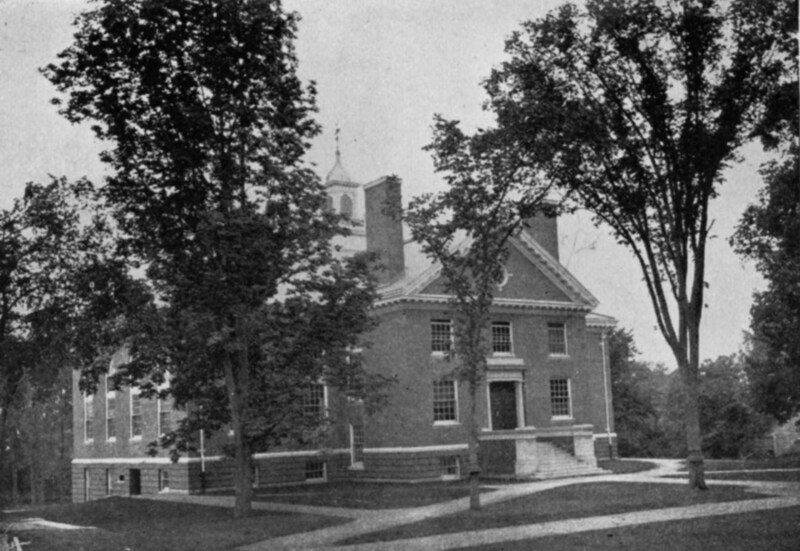 THE founding of Exeter Academy followed hard upon that of the sister institution at Andover. 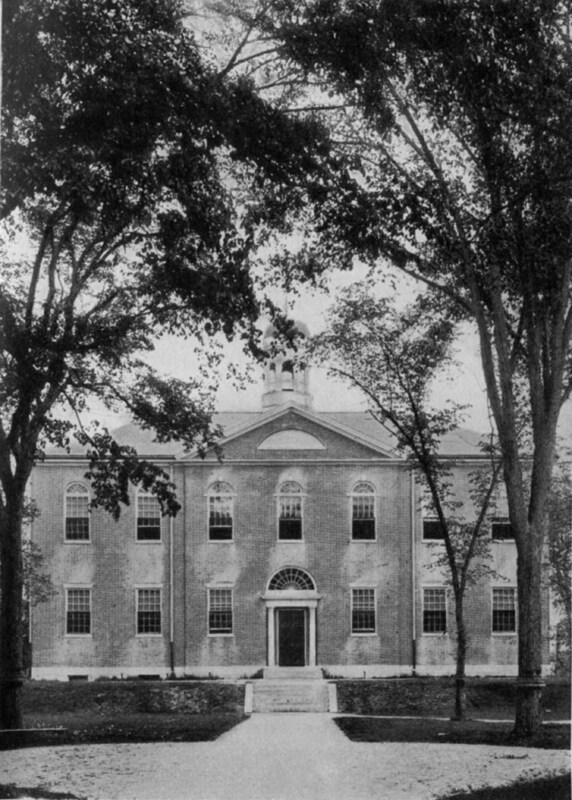 When the success of the latter seemed to be assured, or, at least, when the school had withstood the practical test of a three years' trial, Phillips Exeter Academy was incorporated on the third of April, 1781. Its purpose, in substance, as set forth in its charter, differed slightly, if at all, from that of the school at Andover, aiming at "promoting Piety and Virtue, and for the education of youth in the English, Latin, and Greek languages, in Writing, Arithmetic, Music, and the Art of Speaking, Practical Geometry, Logic, and Geography, and such other of the Liberal Arts and Sciences or Languages as opportunity may hereinafter permit." A charter having been obtained, Doctor John Phillips, of Exeter, on the ninth day of January, 1782, conveyed formally to the academy trustees all his interest in many tracts of land in various New Hampshire townships. His deed of gift was styled a Constitution, like that of the deed to Andover, and included a series of regulations which he directed to be read at each and every annual meeting of the trustees. Good, common-sense regulations they were, and Doctor John did not mean that they should ever fall into what in these days is sometimes characterized as "innocuous desuetude." In the earlier part of his career, when fresh from Harvard College, John Phillips had preached for a time, and then, after listening to the impassioned discourses of Whitefield, felt himself to be unfit for the sacred calling upon which he had entered, and relinquished it. For a little he was a master in a classical school, then went into business, and in later life was a justice in a New Hampshire court. The total value of his gifts to the academy of his founding was about $65,000. The Phillips family have not been without honour in their descendants: Josiah Quincy, president of Harvard College, was connected with it on the maternal side; Wendell Phillips was descended from a cousin of the founders of Andover and Exeter Academies; and Bishop Phillips Brooks was a great-grandson of Judge Samuel Phillips. On the first of May, 1783, the academy was ceremoniously opened under the charge of Master William Woodbridge, who, at the end of five years, resigned on account of ill health, to be immediately succeeded by Benjamin Abbot, who continued at the head of the school for a full half-century. Daniel Webster came to him at fourteen, Edward Everett at thirteen, Lewis Cass at ten, and many another boy famous in after life, came under his influence. Doctor Abbot had been at Andover Academy under Master Pearson, and went immediately to Exeter after his graduation from Harvard in 1788, receiving a yearly salary at first of "one hundred and thirty-three pounds, six shillings, and eight pence, lawful money," increased in 1799 to seven hundred dollars, with the use of a dwelling-house. He is reported to have been tall and graceful, with not a little sweetness softening the dignity of his expression. Was he a believer in corporal punishments? Most certainly; what schoolmaster was not, a century ago? And his punishments were no light afflictions of the moment, either, but substantial, thorough-going affairs, admirably well calculated to impress youth with a sense of their reality. The sternness of his manner disappeared, it is true, when the punishment was over, but the uncomfortable period immediately preceding its disappearance was not readily forgotten. His pupils retained the most affectionate remembrance of him in after life, however, and the Abbot Scholarship at Harvard University commemorates both the master and their thought of him. Doctor Abbot was succeeded in 1838 by Principal Soule, who had already taught for seventeen years in the academy, and the fiftieth year of his continuous service was celebrated in 1872. In June, 1883, the institution observed its centennial anniversary, an event quite within what may be called modern times, when the history of a school is being considered, and very naturally, on that occasion, mention was made, more or less detailed, of the academical roll of honour. It is too long for full recital here, but it may be said that on the list of the alumni, up to that period, there had been seven Cabinet ministers, twelve governors of States, four justices of the National Supreme Court, nine college presidents, fifty-two college professors, four eminent historians, three major-generals, and two rear-admirals. It is harder to differentiate Exeter from Andover than from any other of the great schools of its class, and yet from Andover it differs in certain respects discoverable after extended acquaintance with both. The Exeter graduate would probably instance with most enthusiasm the fact that at Exeter boys are placed on their honour from the time of entrance till that of leaving. In all schools this principle has more or less extended application, but at Exeter it appears to find completest exemplification both as regards work and conduct. Presumably the system works well in this case, or it would not be followed from one year to another. It is in accordance with its workings, therefore, that at Exeter the visitor discovers no common study-hall, as at other institutions, for the use of the school in whole or in part. Even the youngest Exeter lads prepare their lessons in their own rooms, whether these are situated in the school dormitories or in private houses approved by the school authorities. From the foundation of the school in 1781 the honour system has been characteristic of its life, and in the view of many this interprets the strong hold on the affection of its graduates which the school undeniably possesses. The very entrance to it has proved in many cases the beginning of the sentinient of mingled confidence and respect existing between the taught and their teachers. The Exeter student will be found on the whole rather more mature than are the pupils at many other schools, the average age being from seventeen to eighteen. In this year of 1903 the extremes are twelve and twenty-five, and as it chances the boy of twelve and the young man of twenty-five are in the same class, the one having had unusual advantages prior to entrance, the other almost none. The two classmates are also chums, for close friendships between boys in the same class but differing much in age are by no means unusual occurrences at Exeter. "Disce aut discede." So runs the motto on the wall of the building known as "School," at Winchester College, England, a legend which perhaps in these days would be heroically rendered "Work or Walk." More or less consciously this appears to be the motto at Exeter, where self-reliance and independence are especially characteristic features to be noted. The school has never adopted the loco parentis theory, save to the limited extent really necessary, and in giving large freedom gradually to its students ere the university is reached, it has hoped to prepare them for the still more independent life there. Lawrenceville, as will be seen, in its treatment of its upper forms, has acted upon the same principle. In those early days of Exeter's history, when no tuition was charged, self-government was a dominant principle, as it is now. Perhaps the circumstance that no one especial class, socially speaking, has been represented here is largely responsible for its existence. Representatives of distinguished families have studied here, as have members of humble ones, and wealth or social distinction has counted for very little in popular school estimates. That they have not counted at all, it would probably be too much to assert, for boys are not wholly distinct from their elders in this respect, but the institution has been essentially and healthily democratic, and therefore, in the minds of some persons, the more "American." As a matter of fact, however, democracy finds much fuller play in the English school than many Americans imagine, and often rather more than in some American ones. Democracy of the right kind is a very desirable attribute of any institution, and it seems to have been generally recognized at any rate as characteristic of Exeter, and the late Sherman Hoar is said to have declared that he never realized what democracy in its best sense meant, or the rights and claims of other boys, until after his experiences as an undergraduate at Phillips Exeter, and that whatever ability he had in perceiving the innate worth of other men he owed to his life here. Surely when lessons of this character have been taken to heart the school where they have been conned has certainly made great advance in its purpose of teaching its pupils what the Phillipian phraseology styles no less accurately than quaintly, "the great end and real business of living." The founder's constitution is in no danger of being forgotten in the school whose existence is due to his munificence, for on a bronze tablet which a graduating class has given to it this sentence stands prominently forth: "It shall ever be equally open to youth of requisite qualifications from every quarter." Whether the benevolent Doctor John ever contemplated the coming of a time when youth of colour should knock for admission at the doors of his academy is doubtful, to say the least of it, but if he had done so it is fairly probable from the temper of his time in such regards, that this contingency would have made no difference in his expressed desires. At all events the clause just quoted renders it impossible for the authorities to draw the colour-line in the matter of admission to the school, even did they wish to do so, which in view of the prevailing democratic spirit is at least unlikely. Coloured youth there are, therefore, at Exeter, and no serious trouble has ever arisen from this circumstance. They have been manly, self-respecting fellows, attending strictly to business, as one may say, and showing little or no desire to push themselves forward. A notable example in this particular was the son of the late coloured Senator from Mississippi, the Honourable B. K. Bruce. Young Bruce, who was chosen orator of his class at Harvard University, in 1902, and whose university record was a brilliant one, prepared for the university at Exeter, and during his stay at the academy took active part in the various interests of the school, but never pushed himself to the front. In addition to great natural ability he possessed the instincts of the true gentleman, and it was the general observation both at Exeter and Harvard, that he never sought the society of the other men, but that they sought him. His case may be instanced as that of one entering Exeter under a serious handicap, but nevertheless winning his way to the front rank under the existing favourable conditions by sheer force of ability and character. At almost any preparatory school some one college in particular seems to be the goal of a large number, if not of a majority of its undergraduates. At Lawrenceville the goal is Princeton, as is perhaps natural from its situation; at Groton, Exeter, and Saint Paul's, it is Harvard; at Andover it is Yale; at Shattuck it appears to have been Trinity at first, but in later years the University of Michigan; while at Belmont the university haven of nearly one-half has been the University of California, with Leland Stanford Junior University and Harvard, next in favour. Causes for the preference are not always apparent on the surface. Juxtaposition naturally counts for much, as in the cases of Lawrenceville and Princeton; Belmont and the University of California; but precisely why at Andover "the stream of tendency" should be toward Yale, while that at Exeter should be toward Harvard, is not so easy to discover. In the days when Andover theology and Yale College were equally and uncompromisingly orthodox, while Harvard College was presumed to be as uncompromisingly unorthodox, a preference for Yale over Harvard manifested at Andover may have been explainable, but the orthodoxy at Exeter being not perceptibly milder than that at the sister academy, the choice in this case is plainly not referable to any such considerations. Although distinctively a New England institution, the patronage of Exeter is certainly national, thirty-five States and the District of Columbia being represented in the list of students of 1903, as well as one from Nova Scotia and one from distant New Zealand, though why one should come from the Antipodes to slake his thirst for knowledge at the Pierian springs of New Hampshire is something of a mystery, unless accounted for by the presumption of missionary labours performed in behalf of the academy by some enthusiastic alumnus in that particular portion of the dominions of his Majesty King Edward, of that name the Seventh. A feature of school life formerly more common than now, but in which a revival of interest has taken place in recent years, is the training in debate. At Saint Paul's this has always been encouraged, but at Exeter it has always been prominent. To stimulate this interest still further a fund of three thousand dollars was established by Doctor Abner Merrill in 1896 for prizes in the English department, or, in the words of the giver, "to encourage earnest and intelligent attention to the art of writing English, and the art of public speaking." By the terms of gift the principal remains intact, the yearly income, one hundred and fifty dollars, being equally divided between the composition and declamation contests. The earliest of the two Exeter debating societies, the Golden Branch, was founded in 1818, and the younger, the G. L. Soule Debating Society, in 1881. Each has its library and society room, in which meetings are held on alternate Saturday evenings and various knotty as well as weighty questions of national and universal import oratorically settled for all time by these enthusiastic Exonians. Each society numbers about thirty members who not only contest with each other, but hold combined contests with other institutions. For three years past the academy societies have held debates most vigorously contested, one may well believe, with the classes in Harvard University, winning one each against the Harvard freshman and sophomore debaters. Ordinary printer's ink is far too pale to record fitly the celebrations of effervescent Exonians on the receipt of the news of these respective victories. Of yet greater prominence than declamation in the ordinary existence of the Exonian, youthful nature being what it always has been, is athletics, for even the most phlegmatic boy enjoys beholding the athletic diversions of others though disinclined to such exertion for himself. The athletic temple at Exeter does not stand forth to view so prominently as at some other schools, for at the period of its erection, some twenty years ago, the gymnasium did not hold relatively so high a place as now in the estimation of school authorities, whatever may have been the case with the schoolboys of that remote era. The Exeter gymnasium, therefore, occupies almost an apologetic site in the rear of the academy itself, typical, it may be, of the earlier conception of its relations to that respected department of the institution as a whole. MAIN BUILDING GYMNASIUM. ABBOT HALL, PHILLIPS, EXETER. It is of goodly size, one hundred feet by sixty, providing for the most if not all of the requirements the young athlete is accustomed to make. Dressing-rooms with lockers, boxing-room, baths, ball practice room ----all these are found in the basement, while in the great hail above what may be called the main business is carried on, the running-track with twenty-four laps to the mile sweetening the hardships of scholastic existence for some persons, while on the main floor large casts of "The Wrestlers " and "A Boxer Resting," form as appropriate as they are novel adornments for such an apartment. The visitor to the gymnasium is very sure to have pointed out to him for notice what is known as the Faculty Shield, a prize established by the Faculty in 1897 to promote a proper class rivalry, as well as an improvement in track athletics, the fact of the gift being thus made testifying strongly, if any such testimony were needful, as to the position of that body regarding the place of athletics in Exonian economy. Upon the class winning the greatest number of points, the points in question being awarded on a basis of competition afforded by athletic conquests, gymnasium decoration, and class attendance, is conferred the honour of having its numerals engraved on the shield. Since 1897 the two hundred and twenty yard board track has seen an annual contest on Washington's birthday, while that illustrious patriot has been still further honoured from an Exonian point of view, by a series of indoor events celebrated in the gymnasium on that same national holiday. "As 'twere some king returning from his wars,"
and brass bands and bonfires but inadequately expressed the feelings of Exonians, both town and gown. Everybody praised everybody else, students and faculty fell, metaphorically speaking, on each others' necks, and a New England rendering of a Roman triumph was accorded the victorious eleven. History becomes nebulous regarding the observances at Andover on the same occasion, but presumably the heavens were hung with black, bells were rung backward, and the mourners went about the streets. It cannot be said with entire truth that the buildings at Exeter are beautiful, but they appear substantial and eminently serviceable, and utilitarians would have us believe that the beautiful is not to be named in the same day as the useful. And with occasional exceptions it cannot be so named --- at Exeter, so far as exteriors are concerned. And still it is evident that when the present academy building was erected it was fondly imagined to be beautiful. It is of red brick of a good rich colour, but it was built in 1871, and what beautiful structure could possibly have been reared at that time in America, the very middle of the architectural dark ages in these United States? The first academy served the needs of the school for eleven years, a new one being built in 1794. This was enlarged in 1821, but destroyed by fire in 1870. Its successor of 1871 stands very near its site. ENTRANCE HALL ON MAIN BUILDING, PHILLIPS, EXETER. But whatever opinions may be entertained of the academy exterior, there can be but one of its internal adornments. Here, indeed, a distinctive feature of Exeter makes itself at once apparent. One might easily imagine oneself in a department of some museum of fine arts, for turn where one may, busts and plaster casts meet the eye in every direction, engravings and photographs of rare excellence cover the walls. As one wanders from room to room it becomes evident that no haphazard principle of selection has been exercised here, but the most restrained, discriminating taste instead. The work has not been overdone, but the happy medium between enough and too much has been precisely struck. In the classical rooms will be seen the busts of Greek philosophers and Roman emperors; cathedral photographs, carbon prints, engravings, etc., will be discovered in the English and other classrooms, while the long corridors display fine plaster casts and statuary. All these treasures have been the recent gifts of loyal alumni, but their presence here is due to the initiative efforts of one alumnus, William Edward Merrill, Esquire, who by his own enthusiasm aroused the interest of alumni regarding the interior adornment of the academy, and as a result of innumerable visits paid by him to Exonians in various places, secured promises to contribute for this end, promises which have been redeemed, as one sees, in most liberal fashion. Nor does the tale of his efforts end at this point, for as a result of his personal solicitations important bequests of rare books and engravings, and literary bric-à-brac have been pledged to the academy. In one case an entire library of this exceptional character has been promised to the institution through the efforts of this same alumnus. SOULE AND PEABODY HALLS, PHILLIPS, EXETER. 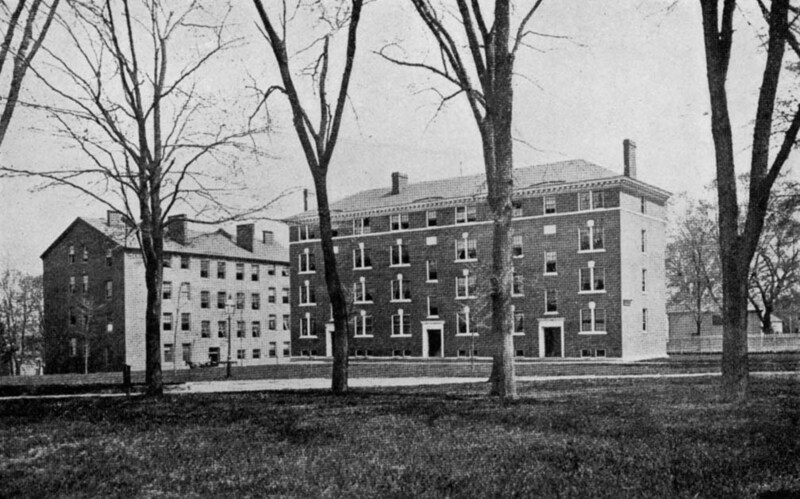 In the early days of Phillips Exeter, its pupils were lodged, as were those of Phillips Andover, in the houses of the townspeople, and not until nearly a century and a quarter had elapsed were certain timid, tentative steps taken by the trustees toward the adoption of the dormitory system. A building which had formerly been occupied as a printing establishment was then fitted up as a dormitory with semi-Spartan accommodations, and this proving a success, Abbot Hall was erected in 1855, the trustees being now assured that it was no longer advisable to have all the students received into the houses of the townspeople as members of their families. In this matter Exeter considerably preceded Andover. 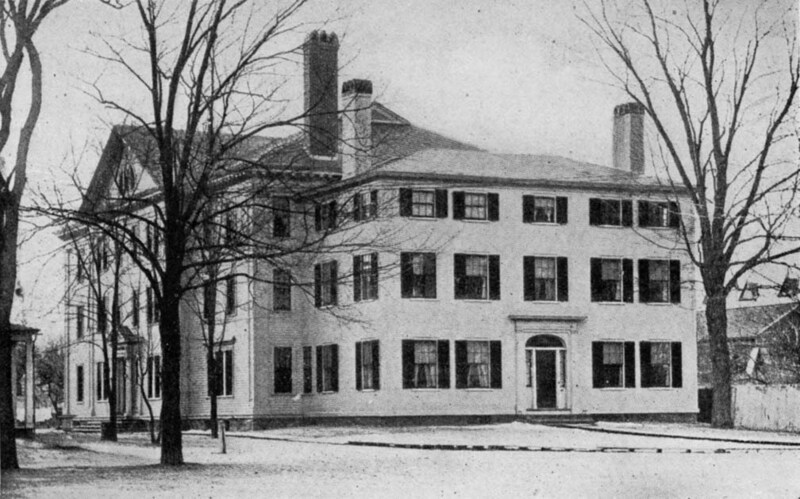 Seventeen years later the Squamscott House, without the limits of the academy grounds, was purchased, renamed Gorham Hall, and occupied as a dormitory until 1889, when it was sold and Soule Hall erected in its stead, in the academy yard, in 1893. The academy catalogue, which describes this later structure as "severely plain," is certainly in the right of it. Equally austere in appearance is Peabody Hall, erected in 1896, and Hoyt Hall, a neighbouring dormitory, built in 1903, makes the third of a group of buildings as rigidly free from anything approaching architectural effect as can well be imagined. As examples of careful, scientific construction and ingenious interior design they are admirable, but one cannot honestly say more in their praise. They might perhaps serve as wholesome examples of restraint in art were there anywhere evidences that their designer was under the necessity of exercising "architectural restraint." Far more pleasing in every way is Dunbar Hall, added to the dormitory system in 1894 as Lawrence House, but enlarged and entirely remodelled in 1901. Here, and here only, Exeter makes an approach to the house system which we shall discover in its most complete development at Lawrenceville, and it may be that in this particular there is a following out to some extent at Exeter of the model furnished at Winchester, England. 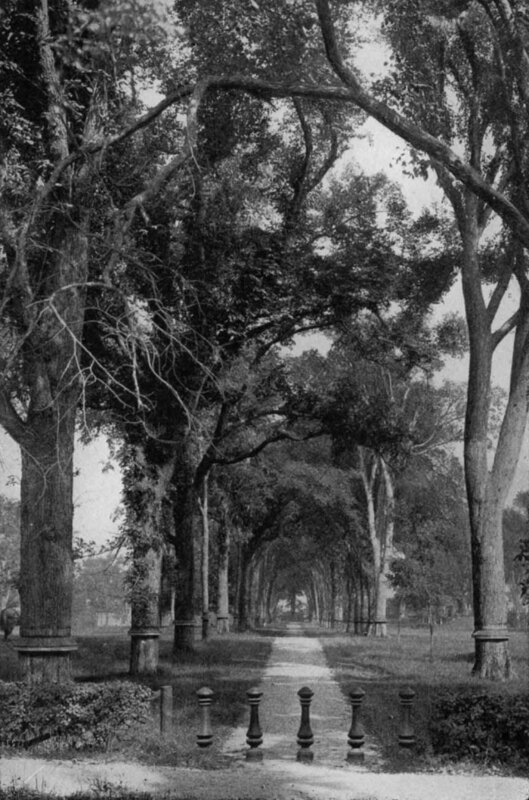 The hall stands on the opposite side of the elm-shaded street that divides the academy grounds, and has a spacious green before it. It is of wood, the older portion counting more than its century of existence; the newer happily adapted to it in general exterior appearance. Here are lodged some thirty boys of the junior and lower middle classes, under the care of a master and his wife, and of an assistant master in addition. The boys' rooms are on the second and third floors, while on the lower one are a large dining-hall, the reception-room and private apartments of the master, an apartment for games and recreations, and a most attractive students' "common room." Even here, however, there is the same liberty as to study as elsewhere at the academy, and the pupils are permitted to study in their own rooms. To the left of the academy stands the building in which, regarded architecturally, Exeter men will in future take the most pride, for it forms the principal exception to the absence of noteworthy architecture at the school, and in which for still another reason they will have cause to feel a pride also. This is the Alumni Hall, built by the contributions of Exeter alumni, and completed in June, 1903. It is of brick, one hundred feet by forty-four, and is to serve as a dining-hall for three hundred students. The huge windows which light it will one day, without much doubt, be filled with stained glass contributed by successive graduating classes, and portraits will line the walls, as at the Memorial Hall at Harvard. At the time of the writer's visit a dense forest of scaffolding materially interfered with the general view of the interior, but its lofty height and flue proportions were manifest in spite of these obstructions. Its existence furnishes additional proof of the intense loyalty to his school which characterizes the Exonian. Another instance of it is shown in Merrill Hall, a three-story structure of brick given to the academy in January, 1903, by Doctor Abner Merrill, an alumnus of 1838, and the giver, some years earlier, of the Merrill Prizes already mentioned. Its lower floor accommodates the administrative offices of the school; on the second are the rooms of the two debating societies; and on the third a pool and billiard room at one end, and at the other a readingroom where students may smoke if they choose. This apartment, with its memorial fireplace given by the class of 1902, its easy chairs, books and periodicals, makes as pleasant a lounging-place for students as can well be imagined. Timid mothers and conservative pedagogues may shudder at the notion of tobacco and billiards being thus publicly countenanced by the faculty of a school, but the entrance to the broad path that leadeth to destruction is not from these cheerful, well-ordered rooms in Merrill Hall, nevertheless. 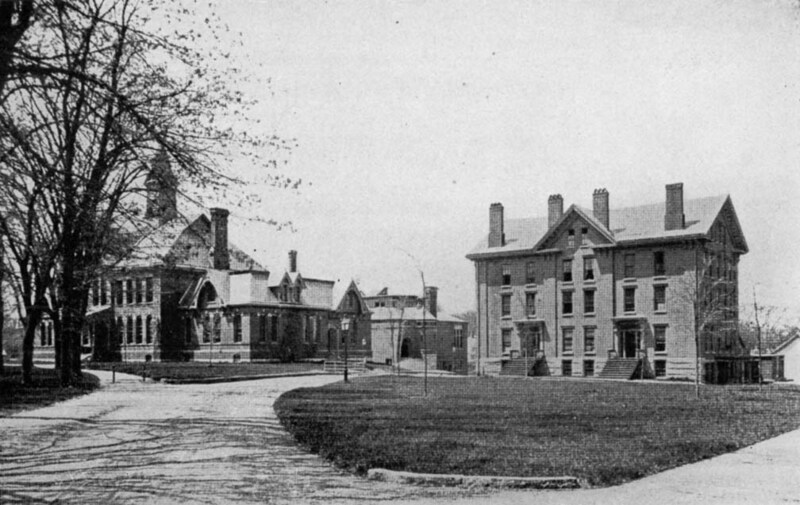 The other buildings at Exeter are the chemical and physical laboratories, of the ascetic architectural type which seems to be accepted as the correct thing in such buildings, and the Athletic House, situated in the seven-acre athletic field on Linden Street, a one-story structure furnished with all the modern conveniences such an educational adjunct is expected to contain. It will be noted that this tale of Exeter buildings makes no mention of either a library or a chapel. The institution has a library, it is true, but no building devoted solely to its use, and the want of one is severely felt. If Exeter's future copy fair its past we may look to see an alumnus appear some day, Carnegie-wise, with a library building in his hand which the academy may have for the taking. A chapel building, however, is less likely to be numbered among the academy structures in the near future, for the reason that the plan of the institution does not contemplate such frequent use of a chapel as does that of several other schools here described. On Sundays the students are obliged to attend service at whichever of the seven Protestant and Roman Catholic churches in the town are indicated by the parents in each case, but the academy, as such, makes no provision for public worship. On week-days there are daily devotional exercises in the large hall, termed the chapel, in the academy building. This is a spacious, lofty-ceilinged apartment, its walls hung with portraits of notables connected at one time or another with the school, but possessing much greater interest as a portrait-gallery than for any other reason. It is a handsome haLL for secular purposes, but wholly unimpressive as a chapel. CHAPEL, WEST SIDE, PHILLIPS, EXETER. A recent feature of Shattuck School, elsewhere noted, will shortly be made a detail of the Exeter institution, likewise: a preparatory school for the academy, based on the model furnished for such schools in England. This will make it possible for very young boys to be prepared for the discipline they will find awaiting them in the academy itself when they reach it. Whether it is wise to send boys from home at so early an age as are those for whom the Shattuck School for Little Boys, and the forthcoming Exeter small boys' school are intended, is another matter, which need not be threshed out here, but regarding which divergent views are likely to find expression. "Give her the glory of going on and still to be."